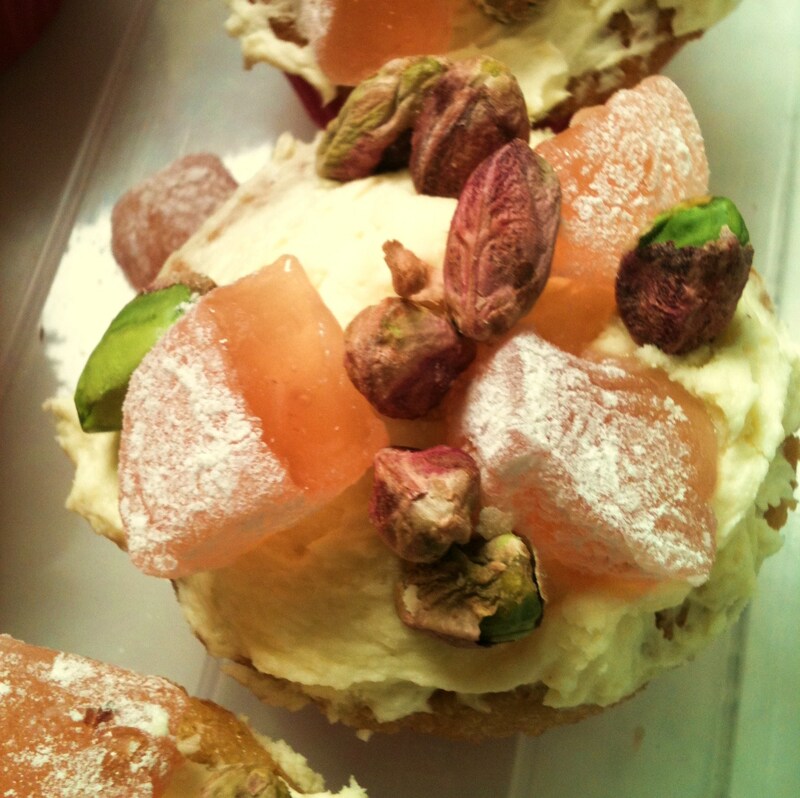 When Miss Kreeight cam over to teach me how to crochet last week, I made us a little treat to eat: Turkish Delight cupcakes. Yum! Stir chocolate, rose water and the water in small saucepan over low heat until smooth. Blend or process nuts until fine. Beat butter, sugar and eggs in small bowl with electric mixer until combined. Stir in sifted flours, ground pistachios and warm chocolate mixture. Divide mixture among cases. Bake cakes about 35 minutes. Turn cakes, top-side up, onto wire rack to cool. I beat together about 100g of melted white chocolate and 500g of cream cheese until smooth for the icing. 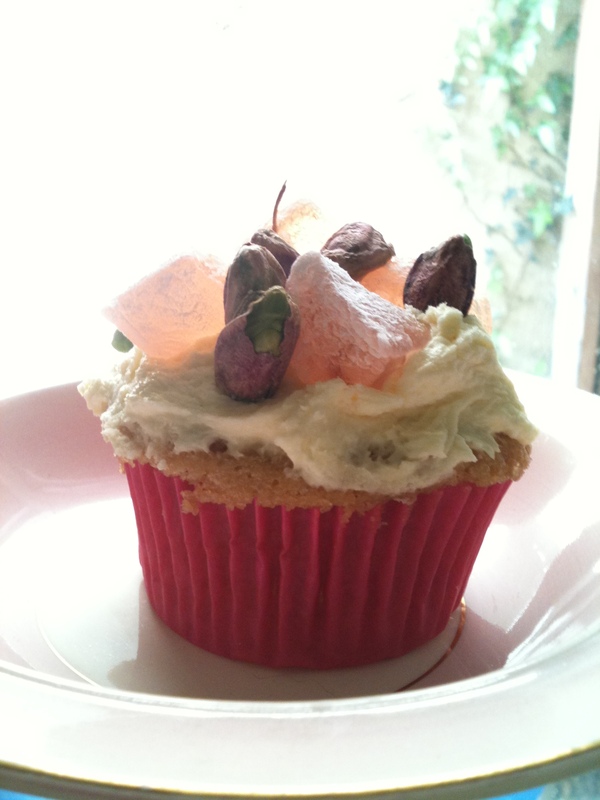 I smeared it on top and scattered pieces of turkish delight and pistachios on top. Cut a 3cm deep hole in the centre of each cake; fill with chopped nuts. Drizzle with chocolate; replace lids. Decorate with pieces of turkish delight and chopped nuts dipped in chocolate. I say do whatever the hell you like. Isn’t that the whole point about cooking? However I recommend listening to Deelite’s “Groove is in the Heart” as you bake these sweet treats. The thrills that you spill as you dance around the kitchen will give you chills and satisfaction. As a kid one of my most favourite things to make was lemon meringue pie. The recipe I used was from the back of a condensed milk tin. Mmmm…condensed milk: the stuff my childhood dreams were made of. The best thing was licking the beaters and bowl clean (yes, I still do it!). I would even secretly leave a bit extra in the bowl so I could eat more of all of that sweet, sticky goodness. The problem with this was that it was SO sweet that I would end up feeling a little sick and not wanting any of the finished product. Of course my mind would be changed once the pie left the oven and everyone was tucking in. I recently came across a recipe for lemon meringue cupcakes! Whoo! Two of my favourite things in one delicious cake! So this weekend, I decided to give this recipe a go and the results were delicious! It’s a lemon and coconut cupcake with a hole cut in the middle filled with lemon curd. A coconut meringue is piped on top and quickly baked on a high heat until brown. Yum! Sweet and sticky! I felt like a kid again. Remember that all ingredients are measured in Australian cups which differ from American and British sizes. Make lemon curd by combining ingredients in a small heatproof bowl over a small saucepan of simmering water, stirring constantly until mixture thickens enough to coat the back of a wooden spoon. Remove from heat, cover tightly and refrigerate until cold. Beat butter and sugar together until light and fluffy. 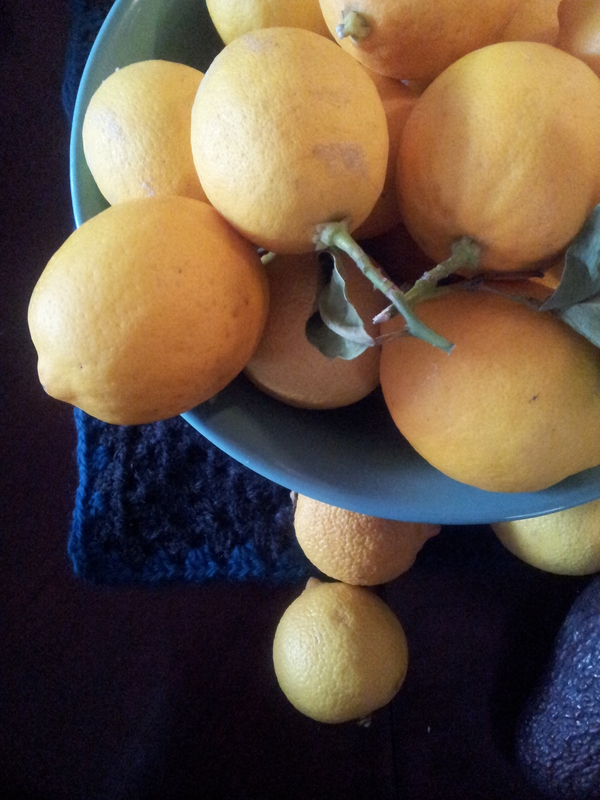 Add lemon zest and eggs and beat to combine until fluffy. Stir in milk and coconut, then sifted flour. Divide mixture between cases and smooth the tops. Bake large cakes for about 25 minutes and small for about 20. Turn out onto wire racks to cool. Increase oven to 220°C/200°C fan forced. Make coconut meringue by beating the egg whites in a bowl with electric mixer until soft peaks form and gradually add sugar. Beat until sugar dissolves and the meringue is smooth and shiny and stiff peaked then fold in the coconut with a metal spoon. Pop the cakes on a tray and into the hot oven for 5 minutes or until the meringue has browned slightly. My mum used to make me pavlova for my birthday. I used to love watching those egg whites turn into those shiny peaks. I thought it was magic! Mum used to hold the bowl upside down above mine and my sister’s head to “check” if it was done and we used to squeal with delight and have a half-secret hope that the bowl’s contents would fall on the other’s head. But of course it never did. Always make sure that the utensils you use are extremely clean and dry. No traces of moisture or oil! Use glass or stainless steel bowls and metal spoons. Always have the patience to keep beating until the sugar has dissolved. Never make meringue on a humid day! Oils and fats interfere with the formation of the foam. A little bit can prevent a good foam from happening. If the sugar is not dissolved properly when you bake it the little sugar granules will melt and crystallize so you will get a weepy meringue. Also because the sugar helps stabilise the foam, not dissolving it means that your meringue could collapse. Humidity can cause your meringue to go a bit sticky and a maybe limp. Go make an iced tea instead! side note: I was a little tired when I made the first batch of the actual cakes and misread the oven temperature and so overcooked them. I got a little grumpy and started again. There was enough meringue left over from the second batch for 6 more cakes so I used the over cooked cakes and added mashed banana and honey instead of the curd. My dad preferred these ones, so mistakes aren’t always so bad!